For many years the New Yorker, the New York Times, Gourmet and other magazines would publish my travel drawings in their magazines. I’ve been to Africa, painted in Europe while on a Fulbright Scholarship, and in Asia on a grant from the Henry Luce Foundation. I’ve spent a good deal of time traveling the globe with my paints, but had yet to visit South America. I recently packed together my paints and traveled to Peru. We began in Pisac, part of the Sacred Valley, and stayed at the Pisac Inn which is run by the niece of a friend and her Andean husband, Roman. They also run Peru Cultural Journeys – a tour company which proved to be of immense value. It was fascinating seeing the Sacred Valley through his eyes and to get a broader perspective than that offered by the guide books on historic and native Andean culture.The Pisac ruins, while not as well known as other sites, are worth a visit, and the views are extraordinary. As we were there at the end of the rainy season, I found a place on the covered balcony of the Inn to set up my paints — overlooking the lively plaza market. I happened to be there on a Sunday, which is the big market day when the Quechua come down from the hills to the town and bring their food and wares to both sell and barter. I got up and out at sunrise and spent the early part of the day painting while everyone was setting up market stalls in the square. The clothes and colors were brilliant. Sitting and painting affords a unique opportunity to observe what is taking place around me from a different vantage point. I then stopped at Ollantaytambo with its extraordinary Inca ruins on the way to Machu Picchu. Hiking up provided wonderful vistas, and the structures themselves offered a plethora of scenes to draw. Machu Picchu was of particular interest to me as a friend’s great-grandfather was Hiram Bingham, who has been credited with the discovery of this site in 1911 (I would highly recommend visiting the Machu Picchu museum in Cusco as the artifacts are there and flesh out the site). My brother was traveling with us and stayed below in the town of Aguas Calientes, while we stayed up at the Sanctuary Lodge which is located right by the park entrance. Not only was this a wonderful place to stay, but it also afforded me the extra time to paint in the evening and early morning. As in Pisac, I was up very early ready to paint and enjoying the birds (being in the cloud forest, it was an ornithologist’s heaven). The views were unparalleled. The staff was very helpful, and although I did not use the hot tub looking out on Huayna Picchu, I did stand on the rim and paint the view, surrounded by the many hummingbirds and lush tropical orchids. I would recommend lunch or breakfast at the Lodge, or stopping in for tea for a break on your way to visit Machu Picchu. If you are there for dinner, we enjoyed the Andean musicians playing the indigenous music. 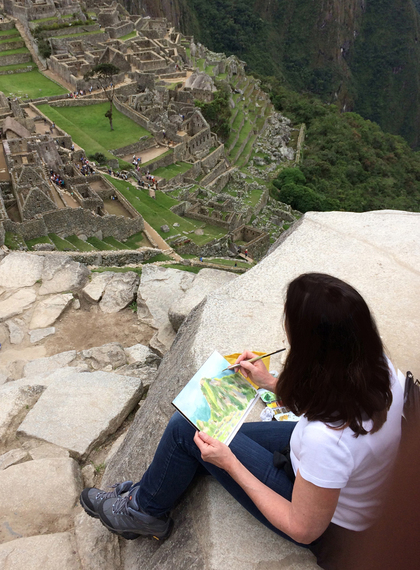 I was up for the sunrise and climbed the Inca ruins with my paints. Words cannot adequately capture how truly spectacular this site is, and how amazing that they could build these structures in this inaccessible place. While others climbed Huayna Picchu (a daunting and steep ascent), I spent the day painting, and hoping that nothing would crawl up my leg dangling over the ledges, or on me from the grass. After exploring a week’s worth of Inca ruins and historic sites, I ended the trip in Cusco, which has a more colonial flavor. I found some interesting ideas in the old monasteries, and particularly enjoyed painting the cloisters of the Hotel Monasterio (a national historic landmark and former 16th century monastery). 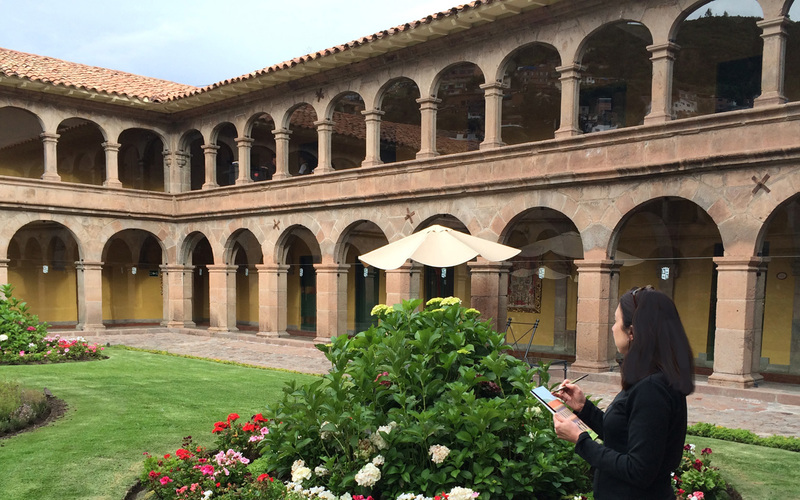 There are two wonderful courtyards and it is a great place to have breakfast, lunch or a cup of coca tea. As it was again raining, I appreciated the architectural cover of the cloisters. We had a birthday dinner at the hotel, and instead of Andean music there was an Opera performance of well known arias as we ate in what was the old monastery refectory. I would recommend a visit to the hotel ‘s former ornate baroque Chapel San Antonio Abad. I came home with sketchbooks full of ideas, and a series of paintings of the landscape, ruins and people of Peru. I have been fortunate to paint around the world, and am glad to have Peru in the portfolio. The sketches and studies offer an interpretation and a perspective that photos alone cannot capture and give you eyes for seeing a different layer of the culture.